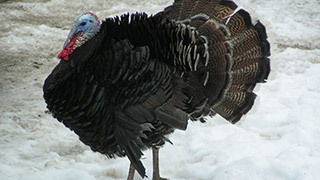 The turkey is a large, flightless bird which is native to the Americas. There are two species of turkeys, the males of each species have a distinctive red, fleshy wattle that hangs from the top of their beaks. They have been domesticated since 100's of years and are mainly kept for their feathers and meat.